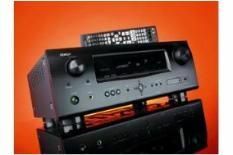 Denon AVR-1911 review | What Hi-Fi? Like sharks, home cinema receiver makers must keep moving or they die. Well, perhaps that's a bit dramatic – but consider Denon's position here. Last year's AVR-1910 was a Product of the Year Award-winner, lauded as an outstanding way to get multichannel thrills, but 12 months on it's no more. In its place comes the AVR-1911, with the on-paper specification to make its predecessor look, um, a bit last year. It's 3D that's the must-have, of course, and sure enough the Denon accepts a 3D Blu-ray signal via any of its four HDMIs and passes it through to your 3D display. Its audio return channel means that one cable between the receiver and a TV with the corresponding feature can work both ways: video can be sent to the screen, and audio from the TV's tuner can be sent to the AVR-1911 for delivery to your speakers. It's cable-reduction nirvana. There's also video upconverting and scaling from any analogue source to HDMI-borne 1080p, and channels 6 and 7 of the AVR-1911's 7.1 speaker configuration can be assigned as surround back, front height/width, zone two or for bi-amping the front speakers. It's not all cutting edge, mind – the menus are functional at best and the AVR-1910's elegant remote has been replaced by an altogether less friendly handset. The mic-driven auto speaker set-up is pretty accurate, though. Decoding and amplifying the DTS-HD Master Audio soundtrack to Cloudy with a Chance of Meatballs, the Denon delivers a tight, brawny soundstage. It's a muscular, attacking and slightly unsubtle device at heart, with iron-fisted low-frequency presence and the resources to stride through big dynamic moments with ease. Effects steering is rapid and secure, and there's fine articulacy to the centre-channel. The entire frequency range is integrated well, though treble information sounds fractionally rolled off – and is all the more noticeable given the AVR-1911's assertiveness elsewhere. Video processing is accomplished – DVDs forced to 1080p are stable and detailed, with natural colours and crisp edges. most testing scenes in A Serious Man. With a switch to stereo music (Red Snapper's Suckerpunch) the AVR-1911 sounds burly and forthright. It's not the last word in focus or imaging, and can get a little wearing, but – heavens! – it's vigorous. In fact, it sounds not unlike its PMA-710 two-channel relative, though without the same grasp of timing. In some ways, then, it's mission accomplished. This machine picks up where the AVR-1910 left off and, thanks to some tweaking, is more flexible and proficient. And yet the AVR-1911 can't achieve the full five stars, which can mean only one thing: the competition is fiercer than ever.